What does it mean to be published now? I can’t believe that I’m publishing yet another post on publishing. But when David Ackley asked the question last week on Fictionaut, so many interesting, passionate, even lyrical responses poured forth that I couldn’t help it when I stumbled on the discussion today. It also felt relevant because I have lately engaged plenty with the alt lit crowd, who are positioned as anti-establishment and highly digitally enabled (not the only ones, of course) and who discuss a similar topic this weekend on Facebook. While I’m affected (and saddened) by some of the experiences shared here, I don’t agree with the negative views on the demise (?) 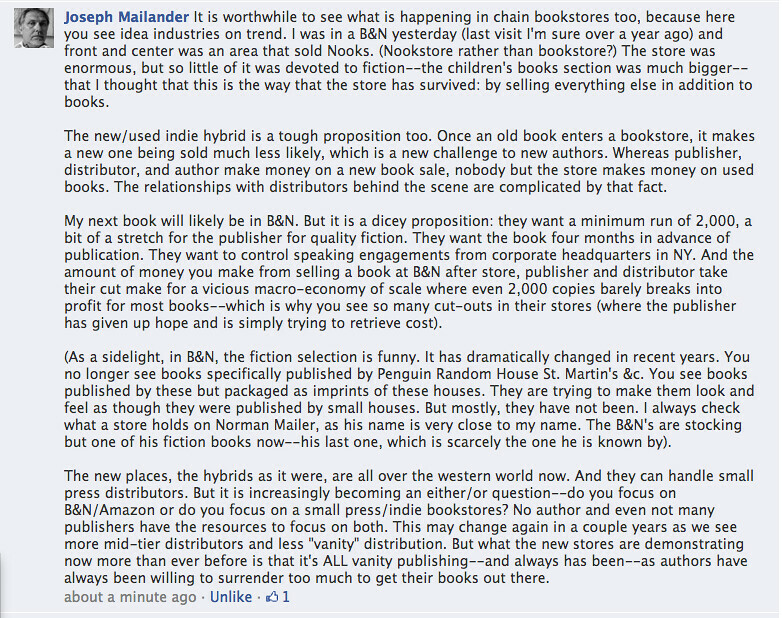 of either publishing or bookshops. I just spend a couple of hours in an English bookstore 5 min. from our doorstep in Berlin. It’s a Sunday. In Germany this means everything is closed, or is supposed to be and I presume the bookstore gets to be open because they also sell coffee and muffins. The store was stuffed with people sitting in the comfortable chairs using it evidently as a place to meet, read and relax in the midst of books. This is not an established bookstore: it’s run by a Czech couple and was opened only a year ago. In our neighborhood, which used to be bohemian and has become affluent over the past 10 years, 3 bookstores have opened in the last 2 years alone. Small bookstores, sometimes specialized, but no chains, run by exactly the type of person that Darryl Price describes. Berlin street scenes: jolly and weird. Now, this is Berlin, it’s a special place with a great influx of artists and young people from all over the world. It’s a trendy neighborhood within Berlin. But when I go to other parts of the city, the picture is similar. At the same time, the big book selling chains that supposedly choked all the small stores, are full, too. These are just observations but what else do we have it in the other day, especially with regard to contentious issues that no 2 people can agree upon? At the same time most of the books that I see published in the literary fiction market are, while consistently technically better written than books for the mass market, of low quality. They are not good books to my mind: they do not lend wings to my imagination. The books in the market on average (the very few exceptions confirm my inference) do not cement my pride in the print-based publication industry. They make me hungry for change, which is coming as sure as eggs is eggs. I spend a fair amount of time listening to, talking with and blogging for younger writers (even though many of them are less “beginning” then I am myself), who embrace the new e-publishing paradigm rather naturally – like the alt lit writers, perhaps with a tad more conceit for the old ways than necessary, but entirely not without respect either. Doing that has sharpened my understanding for things to come. The replacement of one paradigm by another, of one world by another, never is a pleasant process. It isn’t pleasant for people on either side: those who are left behind feel left out and dismissed; and those who build the new world share all the discomforts, uncertainties and fears of the pioneer. One should think that Americans understand this more than any other people. Hence I am somewhat surprised at the (overall) negative tone of the discussion—facilitated in a medium and on a platform — Fictionaut — that did not exist 5 years ago. Dressed to kill? I’m meeting an agent. I say all this while looking forward to another meeting with a literary agent next week. An agent of the aging publishing industry of printed books, I hasten to add. It’ll be the jolly meeting of two dinosaurs and I hope to meet someone I can drink with to the new age, to better books and more power for poets! I can’t really say what “publication” means, but I do know that it’s changing fast, and not to the worse, just to something more acclimated to the current weather. I also don’t know where the balance lies between, say, digital and nondigital publishing for a writer, but I doubt that it was ever easy for a writer to straddle the fences that crisscross the reality of writing or to find the right way to talk to everyone who has staked a claim in the land of story-making. I know nothing about publishing. I only know how to make books my self. But drawing on your comment on independent bookstores – last year a completely independent English language only book shop open in my neighbourhood called Bookish Store (http://bookishstore.net/) They seem to do quite (certainly out of me whenever I go there). There is another very famous bookstore in Istanbul called Robinson Cursoe. I hope to always have such places exist. Whenever I go, I see a lot of people (as you described) enjoying the company of books. Books, like any object, are and can be fetishistic. I don’t mean that in a negative way, rather those who love books (I am sure there are a couple of hundreds millions of us) will always seek the comfort of touching a page as we read. That is not to say we cannot enjoy the fruits of digital publishing. Aside from the big bosses of the “establishment”, how is anyone losing out? Perhaps that is a very naive question. I read thru the F’naut discussion. Many povs. But this question has been giving me a headache since the turn of the century when I began publishing online (after publishing fairly often in papery journals for years and being rejected even more often by the big name papery things) and my writerly academicky colleagues were horrified (with a capital H, in fact, cap it all). So I just don’t think too much about it, except, of course, when I’m trying to woo an agent 🙂 Mostly I write, or not, publish however & wherever, or not . . . you know. It’s just part of what writers do. It isn’t everything. Jane, I have only begun to play this game a few years ago (and while I enjoy games, I already tire of it). I like your formula “it isn’t everything”. Memorable! Ah, that Darryl Price (the Fictionaut link), he has a way with words, wonderful. On “publication”, I’m bemused by the panic about the “changes” — it’s clear that e-publishing is going to be a giant part of the future reading experience, but is this really so different to our past? It used to be that stories were told around a fire — maybe even before fire — and this continues. Then we wrote things down, and the words were painted on walls where everyone (everyone!) could see them — or scribbled onto smaller things and passed around. Tablets, boards and books. Nothing has changed. Is it true to say that the internet provides a wider audience? A more accessible audience, and we can publish ourselves…? Writers could always get stories out there, with or without big publishers – look at Dickens (Wiki has an interesting piece on the Victorian penchant for serialised fiction) — and stories have long been shared via group storytelling in local pubs or on village stages, or letters written, read and passed around… Now we can publish on the internet and immediately, the whole world can see our words and this has created a stir — look! Any old arse can write a book and publish to The Whole World! But in truth it’s no different to the man with a tale who takes it to the pub and wets a few palates before beginning because on the internet like any other stage or place or piece of paper, it’s all about storytelling, and all about the people who hear or watch us – and people haven’t changed. The internet has made publishing mechanisms accessible… if you know how to do it all yourself, you can “make a book” alone – but if not, you’ll want people to help. The people with the technical abilities, proofreaders, editors and networks used to be called agents and publishers; maybe they still will be. It doesn’t really matter because the mechanism does not make the audience. Publishing is just setting a story down. Doesn’t matter how you do it, I reckon it’s going to stay the same as it ever was. — you have to say hello, there has to be a tale to tell, and people have to want to hear it. I hope so. One of the things I would LOVE to see being slapped into the garbage can is this idea of “vanity” publishing. Technology has given us all the tools to put out, truly INDEPENDENTLY, a brilliantly made (and hopefully written) project, if one is willing to work hard. I see it analogous to what the Big Labels in music publishing have had to withstand and adapt to: an influx of talented, independently minded musicians who choose to circumvent stifling contracts, which take advantage of their creativity, and instead write, record, and produce their “products” independently. And then tour, to promote them. The stigma of “vanity” needs to be defeated. With a small, loyal team consisting of 2 editors (copy & developmental), and a graphic artist, a writer can easily produce his/her book using tech tools from Amazon or Lulu, and distribute it via Amazon or any other channel. Indie publishers expect their authors to do as much legwork promoting as an independent writer who has worked on his/her book himself/herself. The beauty is in the profit sharing; sometimes as high at 70% royalties go to the independently published writer. Nowhere will you find that staggering split; and if one works hard to write, produce, and promote his/her book, one can expect to be quite pleased. The 21st century is here; yes, we might very well see a flooding of the market with mediocre, self-published books, but I believe the good material will find its place within the community. I must say conversely (and I won’t name any names), I have bought books from indie publishers which looked horrendous, or were typeset crookedly. A more recent one I spent $15 to purchase had its entire back of the jacket in blurry writing, thus making the blurbs and any other information illegible. I’m with you on all of this, especially you believe that “the good material will find its place within the community”, which is a good way to put it. Somehow the community is the central paradigm from which all else will follow. Regarding the quality of indie productions I have mostly been positively surprised. If I’m not mistaken, one of my publishers works with a print on demand provider for my book and am interested to see how this pans out. As for the royalties split, I haven’t been too keen on beautiful numbers so far because it’s early days and I am mostly keen to get anywhere with this publishing thing rather than get wealthy… I do feel rather naïve and surrendering about it all, but as I said above in my comment on Joseph’s post, I believe surrendering is generally not a bad start. It seems therapeutically appropriate. My on-demand printer (is actually a division of Amazon) has been amazing both in quality and speed filling orders. I have nothing but accolades for POD from my own experience. In fact, some indie publishers use CreateSpace as their printer…I know the address of the company too well, despite not listing their name in the press’ credits. Very interesting Stephen! You’ll notice, when reading through the comments, that others have also drawn this parallel to music making and indeed we live in an age of hybridization: all the arts are moving closer together, which redefines both output and operation for every single art.